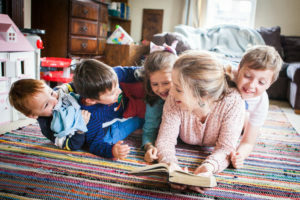 It’s a sad irony that the years when storyteller Amy Robinson and I lived in the same city never overlapped with the years of me being a parent, as I think our family would have loved her storytelling performances. The next best thing to being able to watch Amy, though, is surely to immerse ourselves in her fabulous Lent devotional. I say ‘immerse’, but let’s get this out of the way from the start: our family has recently exploded from four to six, and the only things in which we’re immersing ourselves just right now are toys, shoes, poo and melodrama. Anything else – this wonderful resource included – merely gets a toe-dip. 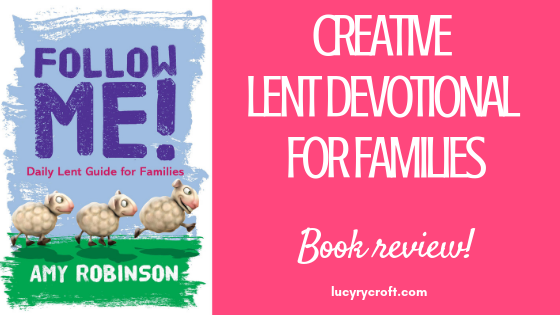 That doesn’t stop me from raving about Follow Me!, Amy’s new Lent devotional for all ages. Family Bible times are such a tough one to navigate, with different ages, interests and timetables to contend with. But here is a resource which accommodates all that. Some of the activities were too old for my under 6s – but that simply means I can use the resource for the next few years. Some of the activities needed a bit of preparation or forethought – but then again this offered flexibility. It gave us license to extend, or cut short, as suited us. I love how the book is so structured, and yet offers so many open possibilities. This is how Follow Me! works: It starts on Ash Wednesday, and follows a different Bible story each week throughout Lent. Each day there is an activity based on that Bible story. This might be a creative retelling, some history/context, a poem, questions for ‘wondering’, a craft or a prayer. Every Sunday there’s a ‘community day’ which encourages your kids to do something simple with others. This is designed to be done within a church community, so is perfect if you attend church on a Sunday! I just love the spontaneity this book initiates. This is the fishermen’s boat on Lake Galilee. My kids chose their own props to add to Amy’s beautiful words. You can mix and match the activities as much as you like. Perhaps you’ll pick up the resource once a week, or every day, or whenever you all manage to come together. Unlike many devotionals, Follow Me! will work for these different levels of time commitment. Please don’t think it’s too late to order a copy! (Or attempt to win one, see below.) This resource is SO flexible you can use it at any time during Lent – and, of course, unlike Creme Eggs, it will keep for next year, and the year after, and the year after! I find Lent a long time in which to engage my children’s interests in the run-up to Easter. Usually we do Shrove Tuesday, and then forget about anything Easter-related until Palm Sunday. I like the fact that this resource manages to sustain the interest with structured Bible readings leading up to Easter. Not that we’re there yet, but I can imagine my kids sticking with this resource for the next few weeks because it’s something different and active, and there’s plenty of variety. Follow Me! is simply a family-friendly version of what us adults appreciate through Lent: the opportunity to pause, consider Jesus’ life and ministry, and ponder what it means for own lives. Brilliant idea for our Grandkids.what a brilliant idea as lent is awkward to explain. Will give it a look n c if it’s ok for up to 11yrs. Youngest is five so should b ideal. Thanks for the information. Amazing blogger family related topics and food for thought. Ooh sounds great. Haven’t come across this one. Ooh haven’t seen either and they sound interesting. Will check them out! Just got our Lent/Easter box down today and found journals/devotionals/crafts a plenty! Forgot I had so many! There never seem to be as many ideas going around as for Advent, and yet here I am a few years into parenthood with quite a stash! Great idea. We have a 5 year old and a 18 month old and are in a church which currently has a bit of a rift in it at the moment (sadly looking like a split). We’ve decided to take a break from community for lent! It sounds strange I know, but having given so much of our lives for 10 years, we finally felt God calling us to rest and return to focus on His word without the distraction and heartbreak of church politics in between. We will attend other churches and practice the discipline (for us) of watching and waiting on God, listening to Him and not serving, busying ourselves and ‘fixing’ church in place of that. It’s both scary and exciting at the same time. We’re looking for a resources to focus us as a family and I wonder if this is it. Sadly I imagine the community bits couldn’t be done in a church environment with strangers, but perhaps we could do them at school? So sorry to hear that 🙁 Your decision for Lent sounds very wise! Yes you could do the community bits at school or perhaps with a Christian friend or family member. E.g. week one’s idea is to ask an older Christian about their journey to faith. This could even be done over the phone/Skype with a long distance Christian relative or godparent or friend. Good luck!